Angus McBean Photograph. © Harvard Theatre Collection, Harvard University. Elsa Lanchester (1902-1986), Actress. Sitter in 14 portraits. Angus McBean (1904-1990), Photographer. Artist associated with 270 portraits, Sitter in 79 portraits. Following a memorable performance as Anne of Cleves opposite her husband Charles Laughton in The Private Life of Henry VIII (1933), Lanchester moved with him to Hollywood to make her celebrated film appearance in the Bride of Frankenstein (1935). 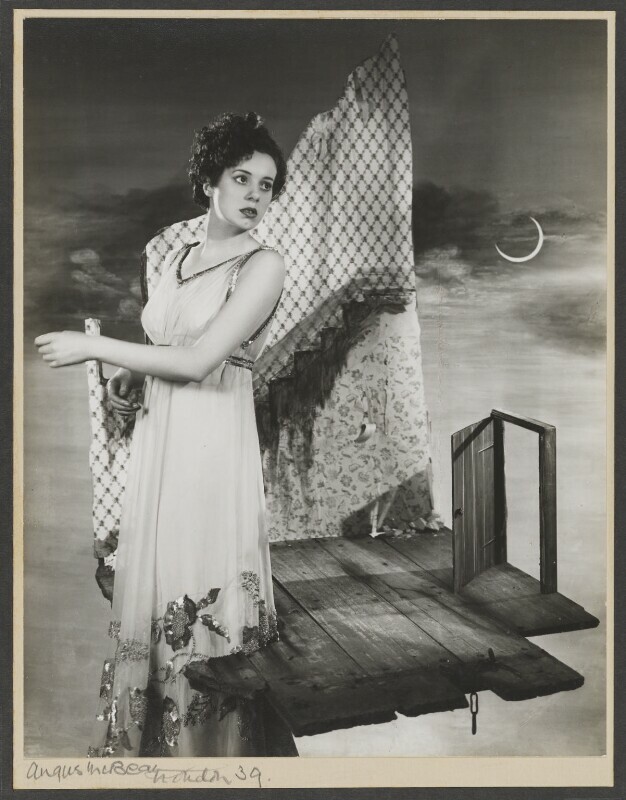 Angus McBean, best known as a theatrical and portrait photographer, arranged Lanchester before an illusionistic Dalíesque backdrop. This is part of a series of Surrealist portraits of actresses he photographed and which appeared in the illustrated magazine The Sketch from 1937. With the use of props and set design to create visual tricks, Lanchester appears to emerge from the floorboards.